28 mm 18K rose gold case set with 36 diamonds (approx. 0.3 ct), 6.1 mm thick, diamond bezel, gem set dial with 18K rose gold hour markers and 312 cut diamonds (approx. 1 ct), 857P quartz movement, 18K rose gold bracelet set with 162 diamonds (approx. 1.3 ct), integrated buckle. Water resistant to 03 ATM. 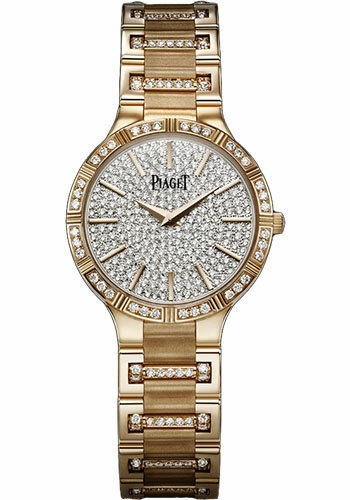 28 mm 18K rose gold case, 6.1 mm thick, bezel set with 36 brilliant-cut diamonds (approx. 0.7 ct), silvered dial with batons, caliber 857P quartz movement, 18K rose gold bracelet, integrated clasp buckle. Water resistant to 3 atm. 28 mm 18K rose and white gold case set with 36 diamonds (approx. 0.3 ct), 6.1 mm thick, diamond bezel, silvered dial with 18K rose gold hour markers, 857P quartz movement, 18K rose and white gold bracelet, integrated buckle. Water resistant to 03 ATM.